Thread thin rice noodles are the thing to eat if you want some energy but you are feeling a little delicate. They are prepared quickly by immersing in plenty of boiling water for 5 minutes after which you drain and then refresh them in cold water. You then add them to the other ingredients in a stir fry, for example, where they heat up quickly. For this chicken noodle pho I have allowed 50g noodles per person but you could add some more if you are feeling really hungry. Rice noodles are gluten free, low in fermentable carbohydrates and are tolerated by most people. If you travel to South East Asia you will see people eating pho everywhere you go. It is street food at its best. Pho is cooked in a wok sitting on a little burners or small fires contained within a clay pot. Pho contains a good stock, some fish sauce and lime or tamarind juice and lots of fragrant, soothing herbs such as lemongrass, coriander and ginger. A small amount of fish or meat is added along with a variety of vegetables depending on the season. In this recipe I have chosen vegetables that are low in fermentable carbohydrates and just a little marinated chicken. I have flavoured my pho with chives and spring onion tops rather than onions. Remember to either make you own stock or use just a small amount of a ready made stock that you trust not to upset you. If in doubt flavour your pho with just a little soy sauce, fish sauce and lime juice. Although chilli is low in fermentable carbohydrates do be careful if using it as the capsaicin can irritate the gut and other mucous membranes. The active component of chilli, capsaicin stimulates nerves in the mouth to feel heat and pain via a receptor known as TVRP1. It also makes nerves grow. Capsaicin is an ingenious compound because it deceives the body into thinking it is hot when it is not. Interestingly mint does the opposite. Menthol blocks this receptor and induces a cool sensation in the mouth. South East Asian cooks know this all too well and use minty aromatic herbs in their delicious salads to accompany hot spicy dishes and relishes. Because capsaicin stimulates nerve fibres to grow it means that over time your mouth becomes acclimatised to eating chilli and you need to eat more to feel the same effect. This recipe is a lighter version of the traditional Vietnamese beef pho in a wonderful lemon grass mint, coriander and lime broth. It is a nutritious, balanced meal and can be adapted to suit you by leaving out any foods that upset you. Ready cooked chicken marinaded in oriental flavours like lemon grass and ginger can be used if you are short of time. Just check the ingredients list on the packet to make sure they won’t upset you. Bring approximately 1 litre of water to the boil and add the noodles. Cook for five minutes, drain and refresh under cold water to stop them cooking. Put to one side. Slice the chicken and place in a small bowl with the grated ginger, lemon grass and 1 tbsp oil. Season the chicken with salt and pepper and mix well. Set on one side and prepare the stock and vegetables for the pho. Pour a little oil in a wok or large saucepan and gently cook the chicken pieces for 5 minutes until just beginning to colour. (If you are used precooked chicken add this to the wok or pan now). Add the spring onion tops and red pepper slices and cook for a couple of minutes until soft. Pour the vegetable stock, fish sauce and lime juice into the wok (or saucepan) and bring to a simmer. Add the vegetables and cook for about 8 minutes until the vegetables are cooked. Four minutes before you are due to serve the pho add the noodles to the wok to reheat. Season with soy sauce and salt and pepper and stir well. 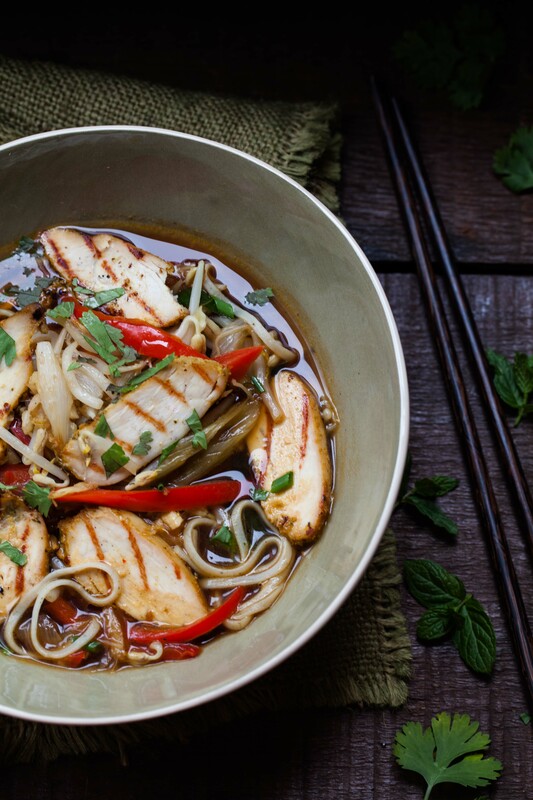 Serve the pho in bowls scattered with fresh herbs. 17 Sep	This entry was written by Joan Ransley and published on September 17, 2014 at 10:42 pm. It’s filed under Dinner, Lunch, Snack and tagged chicken, cooking, dietetics, FODMAPS, gluten free, healthy eating, IBS, lactose free, low FODMAP, noodles, pho, Rice noodles, sensitive gut. Bookmark the permalink. Follow any comments here with the RSS feed for this post. Just sent this recipe to my mum, looks delicious!